"There are men so philosophical that they can see humor in their own toothaches. But there has never lived a man so philosophical that he could see the toothache in his own humor." "You know those things that you throw the twigs into and it spits them out? That's what I do. The branches are like life, and I throw them into my head and some of it comes out as humor." "Common sense and a sense of humor are the same thing, moving at different speeds. A sense of humor is just common sense, dancing." "If you want to make an audience laugh, you dress a man up like an old lady and push her down the stairs. If you want to make comedy writers laugh, you push an actual old lady down the stairs." I recently received a book for a gift, Revenge of the Vegetarian. After reading the reviews (which authors often traditionally place upon the back cover), I knew then and there that this book would be worthy of my review. The ten quotations included in today's email summarize the psyche of this clever book which best belongs as entertaining reading material in the magazine rack next to where you sit upon your white porcelain throne contemplating the daily mysteries of the universe. "If I had no sense of humor, I would long ago have committed suicide." "Humor is reason gone mad." "Real comedy doesn't just make people laugh and think, but makes them laugh and change." "Comedy has to be based on truth. You take the truth and you put a little curlicue at the end." I ordered two copies just from the LOOK INSIDE tidbits. I've been a vegan animal rights activist for over 25 years and boy, do I need some humor! Drowning in these horrors ALL the time? Thanks for tickling my funny vegan bones! If all the book provides is a humorous table of contents, I'll be happy! Jim Tilberry: I have lived a meatless life since 1998 when I was visited by a pig in a dream asking me to give up bacon, ham and all other meat. Knowing that pigs are very intelligent I did not question the request. From that day forward I read many reputable books about vegetarianism. Okay, truthfully I didn't actually read them, but I did read most of their book jackets. So I figure that made me sort of an expert. I also learned a foreign language (Veg Speak) and began using veggie words like Seitan, Tofurkey, and Yuckthishasmeatinit. 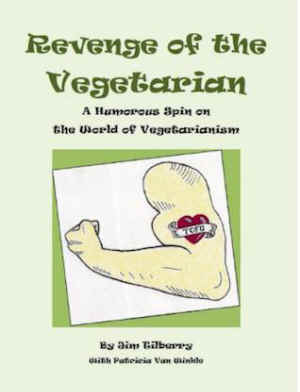 My new book, Revenge of the Vegetarian, examines the vegetarian world in an absurd, humorous and irreverent way. 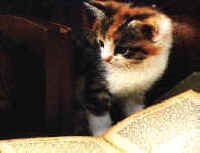 Many say the book is very funny. In fact, recently the pig returned in a dream and told me so.